A media job search involves more than just introducing yourself through a memorable cover letter and creating the perfect media resume. You have to get your materials in front of the correct people in order to get hired. These top media job search tips can be combined to give you the best shot at getting the job you want. Most media pros have occasionally blanketed the country with resumes. If you're looking for your first media job, or if you're sitting at home after becoming the victim of media layoffs, you likely have the time to create these mass mailings. It's true that if you apply to 200 companies, you technically have a better chance of getting a job than if you only apply to 20. There are flaws to this strategy, though. One of the most common media resume mistakes is to send a generic cover letter and resume to every company. Mailing a cover letter that simply says "I want a job in media" to a radio station in Orlando and a public relations firm in Chicago isn't going to get you noticed. It's better to concentrate on the 20 companies, research their needs and write targeted letters specifically to each one. If you don't get a phone call from those 20, then expand to the next 20. An overlooked research tool is to use contacts within a company to get information about job openings. While the advertisement for a job opening might say "no phone calls", that normally applies to the manager doing the hiring. For a TV news reporter opening, call the newsroom. Find out about the person leaving the station, the reason why he's going and what kind of experience he had. Also, ask about the news director who's doing the hiring. Learn what skills she wants in a news reporter and when she's planning to fill the job. This knowledge will help you write a cover letter specifically for the opening at this station, which is far more effective than sending something generic. It's up to you to decide whether you should mention that you called the newsroom to research the job. The Internet makes a media job search so much easier than in years past. 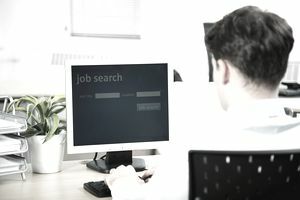 You can quickly scour media company websites for openings, or pay for access to a subscription-based web service which puts job openings at your fingertips. The problem with only applying for openings you see online is that you'll likely be one of the hundreds of candidates for each job. Sure, someone has to get the job, but being one of 500 applicants may make you feel as though you have a better shot at winning the lottery. A better strategy is to use the Internet to find out who might be leaving a media job, then applying before the opening becomes official. It takes some work, but if you see someone at a company has posted her resume all over the web, chances are she's heading toward the exit door. You can be the first to apply and beat all your competitors' resumes to the boss's desk. A headhunter can help in your media job search. There are two types of headhunters who are common in the media industry. The first headhunter is paid by the media company to find qualified candidates for job openings. You can send your materials to this service in the hopes that it will pass you along to clients. The downside is that you'll likely never know if or when your resume is being sent out. A second type of headhunter charges you for its services. Because you're the client, you'll get much more feedback about your work and how you're being marketed for job openings. With most headhunters, their focus is getting paid by someone for their services. That means it's likely that your resume is going out with dozens of others, which puts you in the same situation as if you're applying for an online ad. A headhunter might know about unadvertised openings, but it's unlikely that you'll be the only person the headhunter pushes to get the job. Using a talent agent may make you feel like a Hollywood hotshot. However, there are many pros and cons of hiring an agent to help in your media job search. A talent agent works for you, but be prepared to pay. You may have to pay upfront fees, but it's more common to pay part of your salary if an agent finds you a job. If she also negotiates your media contract, you'll probably pay even more, possibly 10% of your salary. It takes a great deal of research before hiring an agent that's right for you. After all, you'll be forking over money, so you shouldn't sign with just anybody. Some agents have dozens of clients. The best agents will find out about an opening and concentrate on marketing the client who's best for the job. Others will market several clients, not caring which one gets hired as long as they get paid for their representation. A media job search isn't easy, especially when there are many more applicants than there are jobs in the industry. The time you devote to a well-planned, focused media job search will help you avoid wasting time and money while getting the job you want.